Well, there were some folks in Terp Nation wondering why the boys from College Park didn’t get the call from the Big Apple for an appearance in the N.I.T. never mind the bigger dance run by the Suits In Indianapolis (formerly Kansas). This photo shows exactly why they didn’t get that call or any other call throughout the basketball season. Here’s what Deadspin had to say: Maryland won more than their first-round ACC Tourney game against N.C. State 75-67 tonight. They also roared ahead in the "Fan With Most Totally Dope Hairstyle" rankings. 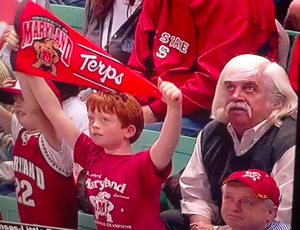 The Terps, who face Duke tomorrow night, still need to pile on some wins to get bubble consideration, but if Hairman's identity becomes public knowledge, tipster Matt H. will buy him a beer. Hell, if he ever rides the hobo rails through Philly, make that two beers. *Items in italics may, or may not, be true. Props to Pop Culture Editor Young A.T. for the tip!